The March 1966 edition of F.I.S.H. Tales, a newsletter for the Florida Inland Sportsfishing Hosts. The newsletter covers various topics regarding Central Florida fisheries. Topics discussed include a new fish hatchery, seining programs in Lake Tsala Apopka and Lake Dora, and catch limits for panfish. There is also discussion of pollution problems in Lake Apopka, and Governor W. Haydon Burns' (1912-1987) pledge to find a solution. Also mentioned in this bulletin is the current presence of bass in Lake Apopka, as evidenced by Don McAllister's fishing show, Going Fishing. 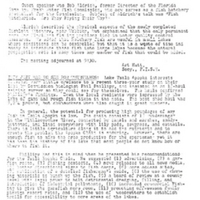 Photocopied four-page newsletter: F.I.S.H. Tales, March 1966: binder 1966, Friends of Lake Apopka Archives, Ginn Museum, Oakland Nature Preserve, Oakland, Florida. Digital reproduction of photocopied four-page newsletter: F.I.S.H. Tales, March 1966. Originally published by F.I.S.H. Tales. “F.I.S.H. Tales, March 1966.” RICHES of Central Florida accessed April 18, 2019, https://richesmi.cah.ucf.edu/omeka/items/show/6849.